There’s a new version of the Respondus quiz-building software available for faculty which fixes a problem connecting to our Blackboard Learn server. Faculty will need to download and install this new version, which is available inside Bb Learn’s “Faculty Support” tab. More information is available on our TLP Knowledge Base. Managing and editing your online course files is about to get a lot easier with a brand new tool available free to faculty called Blackboard Drive. Available for Mac and PC, Bb Drive gives you direct access to your Blackboard Learn content collection files as if they were on your computer, making it extremely convenient to update course documents with the originating software. Editing an existing document in Bb Learn by using Microsoft Word, would be an example. You can read more and find out how to install Bb Drive at https://wiki.csuchico.edu/confluence/x/rIsdAw. Look for an upcoming Bb Learn Spotlight presentation to see Bb Drive in action. The time and date for this presentation will be listed on the TLP webpage. After a successful pilot with 14 faculty during the Fall semester, it’s full steam ahead as the newest version of Blackboard Learn is rolling out across campus. After a pretty rocky start to the semester when Bb Learn had some technical issues and strained under a record usage level, the system is now performing well and reliably for our campus, thanks to incredible effort by staff across Information Resources. Over 440 faculty have attended TLP’s workshops, and there are 630 courses being taught in Blackboard Learn this semester involving more than 11,000 students. If you haven’t had a chance to see what a course looks like or what kind of new features you can look forward to in Blackboard Learn, be sure to watch one of the Spotlight Session videos on YouTube where Chico State faculty demonstrate their favorite aspects of Bb Learn, such as the improved tools for course organization, the Grade Center, and group projects: http://www.csuchico.edu/tlp/learn/spotlight.shtml. New spotlights are coming up and will be announced soon. Beyond the improvements mentioned above, more new features and enhancements are coming to Blackboard Learn. On the horizon are an overhauled text editor and better ways to connect Bb Learn and Web 2.0 tools, so stay tuned as Blackboard Learn evolves! The 2012 Academy e-Learning (AeL) Cohort Four will focus on participation by those teaching GE Pathway courses. Meetings are being held in February 2012 to orient teams to AeL topics and plans for the June institute. The purpose of AeL is to bring faculty together with colleagues to discuss how they teach, how students learn, and how educators can enhance learning by better engaging students with content and each another. A common misconception about AeL is that technology is often cited as its key component. Instead, rethinking how faculty teach and investigating innovative pedagogies that utilize current and emerging technologies are the focus. Ultimately both go hand in hand to build bridges between better classroom solutions and lifelong learning. The curriculum for the AeL program has evolved since its inaugural roll out in 2009. Initially the Chico AeL support team members, drawing on the research of the National Center for Academic Transformation (NCAT), designed a curriculum for a three-week intensive workshop experience. Cornerstones of the program still involve sessions where faculty are encouraged to try new technologies and pedagogies and share what works and what doesn’t. Experimentation is stressed. Additionally, AeL Cohort members from the first three years are now sharing their wisdom, trials and successes with faculty new to the AeL community. This dialogue enriches conversations around how to best engage students in learning. If you are interested to learn more, visit the website, or contact Laura Sederberg at x4326. Applications for teams are due by March 16, 2012 to your Dean. 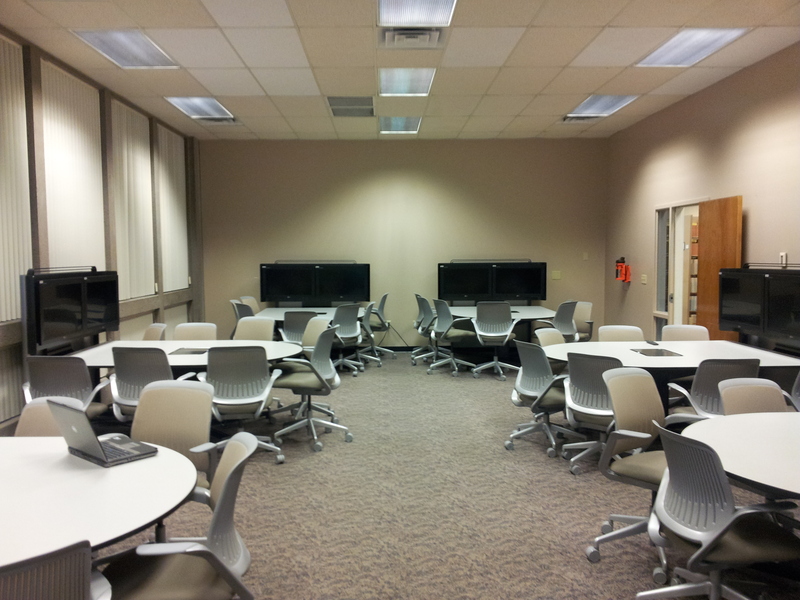 Recently an experimental mediated classroom has been created on the fourth floor of Meriam Library. MLIB 442 has been outfitted with seven “pods” that allow students to share their laptop or tablet displays on LCD TV screens. The pods which seat six people, can be used to enhance student engagement and group collaboration. Currently four faculty are piloting the use of this classroom. MLIB 442 is open during the day so faculty can stop by to take a look when classes are not in session. For more information, photos and the room schedule, please see the the Classroom Technology website. How do we effectively engage in teaching and learning on our campuses and beyond campus as technology shrinks time and distance? In the spirit of this year’s conference theme, Engaging Everyone Effectively, we will look at ways to collaborate, lead, and assess IT’s role within higher ed as it continues to evolve. Join your colleagues and leaders in the higher ed IT community as we explore the many facets of IT engagement. Coming Soon to Campus: The New “Free Agent” Learner—Are You Ready? Chico State is registered next week Feb. 13 -15th for these excellent online EDUCAUSE Sessions from the Annual ELI Conference (held in Austin, TX). We will be streaming the following program in Studio A noted below, all times are Pacific Time. Topics include Mobile Learning, Learner and Academic Analytics, STEM, Emerging Technologies, etc. Please join us and/or forward this message to people in your departments where it is relevant. Studio A is located in the basement of Meriam Library.